Now Austria Says It Will Likely Redesign Hitler's House, Not Tear It Down : The Two-Way The idea is to prevent the property from being a pilgrimage site for neo-Nazis. This comes after a long fight with the current owner. 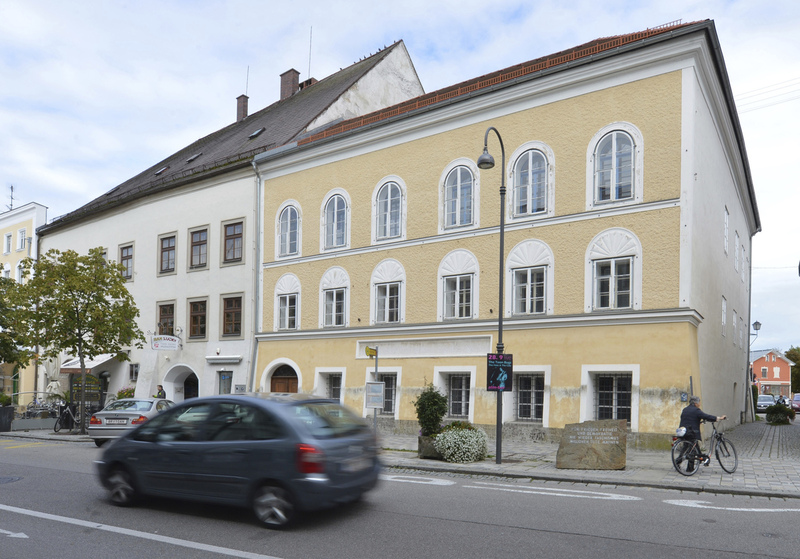 Adolf Hitler's birth house in Braunau am Inn, Austria. A day after the Austrian government said it was planning to tear down the house where Adolf Hitler was born, the interior minister now says it is likely to be redesigned. The idea is to prevent the property from being a pilgrimage site for neo-Nazis. "After years of indecision about what to do with the Hitler house, Austrians thought they had a decision," reporter Kerry Skyring tells our Newscast unit. The interior minister had said the building would be demolished, leaving only the foundation. "But today, the minister says the plan is to give it an architectural makeover that would render it unrecognizable from its current form," Skyring says. He adds that "the new plan comes after members of a government-appointed commission on the future of the house suggested that erasing the house would give the impression Austria was trying to erase its past." This comes after a long fight with the current owner, who for years has rejected the government's attempts to purchase the property located in Braunau, near the German border. The government hopes to eliminate any association between the building and Hitler. "Neo-Nazis sometimes gather outside the yellow three-story structure," Skyring says. A memorial stone outside the house does not mention Hitler's name; instead, it reads "For Peace, Freedom and Democracy" and "Never Again Fascism." "Local resident Gerlinde Pommer's family has owned the home since 1889, [Agence France-Presse] says. The Austrian government has rented the property since the 1970s, using it as a center for people with special needs. "The Austrian government has paid Pommer some $5,600 every month in rent, the New York Times reported last year. "Newsweek says Pommer is 'thought to be in her mid-60s' and 'reclusive.' The magazine adds that her reasons for blocking renovations to the property are 'unclear.' "
There was a wide diversity of opinion about what should happen to the building. Some members of the community "wanted it to become a refugee centre, others a museum dedicated to Austria's liberation from Nazi rule," as the BBC reports. Others simply thought it should remain standing for historical reasons: "a number of cultural organizations previously opposed the building's demolition because it is part of the historic city centre and therefore under heritage protection."